At a simple mass workshop organized by my church, I learnt how to make this in 15 minutes. It was so easy peasy that the children in the group managed to make theirs with minimal adult intervention. I tried it at home today and treated my family to some homemade Pizza Bread. 1. Boil tomato paste with a pinch of salt and sugar. Remove from stove and set aside to cool. 2. Preheat oven at 180oC. 3. Flatten each slice of bread with a rolling pin. 4. Spread tomato paste on the bread with a spoon. 5. 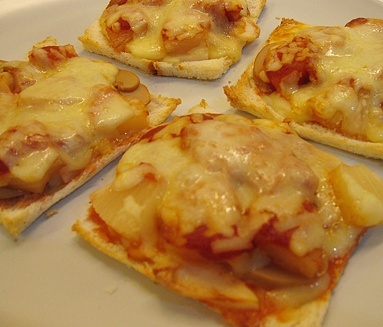 Place mushroom, pineapple, ham and mozzarella cheese on bread. 6. Place pizza bread into the oven and bake for 5-8 min or until the cheese melts and the crust is crispy.